Description: The limited edition includes bonus bluray movie and hardcover box. 02-21-2012 maverickrenegade Description The limited edition includes bonus bluray movie and hardcover box. 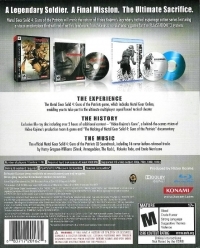 This is a list of VGCollect users who have Metal Gear Solid 4: Guns of the Patriots - Limited Edition in their Collection. 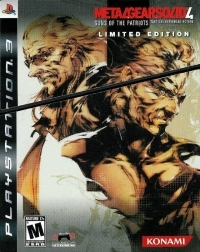 This is a list of VGCollect users who have Metal Gear Solid 4: Guns of the Patriots - Limited Edition in their Sell List. This is a list of VGCollect users who have Metal Gear Solid 4: Guns of the Patriots - Limited Edition in their Wish List.